It’s one thing to have a deck or patio welcoming guests to your backyard; it’s another for it to be as beautiful as the inside of your home. And why shouldn’t it be? If you want you and your family and all your visitors to be comfortable and also impressed with your decorative skills outside of the house, then here are some tips on furnishing your deck or patio. Outdoor furniture can be just as charming and fun to shop for as indoor furniture. And if you know what you’re doing, you’re sure to be happy with the final outcome! It can be a little overwhelming though as there is furniture out there for just about every kind of deck, garden or patio. So first figure out what look you are going for, do you want durable seating that will last throughout the years or are you more concerned with ornamenting your lawn? Do you want to bring a fresh, modern design scheme to your backyard or do you want to preserve nature’s rustic appeal with unassuming furniture? The choice is all yours and as soon as you determine what it is you’re looking for, the easier it will be to plan your shopping and ultimately your budget! To help you brainstorm, though, here are some common furniture ideas for decks and patios. Whether you’re in the market for couch, table, chair, or bar stool patio furniture, you’re going to run into many options. Lately, the trend has been that outdoor furniture closely resembles indoor furniture. Frankly, if you want to spend more time with nature, it will be helpful if you can sit (and even nap) comfortably beside it. But you can’t just think about style and comfort. Even if your deck or patio is covered with a roof, your outdoor furniture is vulnerable to all kinds of damage that your indoor furniture will never have to face rain, wind, dirt, animals, etc. Fortunately, you can invest in weatherproof lamps, chandeliers, fire pits, chairs, benches, tables, and more. It’s probably worth it to spend some extra bucks on buying furniture that will endure. Remember that there are even weatherproof televisions you can place outdoors! Got a house full of couch potatoes? Why not encourage them to lounge around outside in the sun, rather than inside? Not to mention, why not get a patio umbrella to cover the new additions to your backyard? You can get some really cool-looking, decorative umbrellas that help to dress up your backyard and also protect the furniture in it. There are two approaches, generally, that you can take to create an outdoor living space. Fortunately, nature is the best decoration. So often you’ll only have to shop for some basic furniture and position it as you like. However, if you have a backyard that lacks in flora and green or you simply are more ambitious in your design and plan to spend a lot of time outdoors, you can go the extra mile. It doesn’t mean you have to spend a fortune though. Plenty of discount stores will offer ready-to-assemble products of all prices and styles that you can put together yourself. Wrought iron and cast aluminum are good materials to keep on your radar. Furniture made of these may need to be brought into storage for the winter months, but as long as it’s sunny outside, they’ll be around for a long time! And the good news is these materials are not pricey at all. As far as tables go, look for porcelain and glass tables. They do well outside, but they must be shaded from the sun with an umbrella. 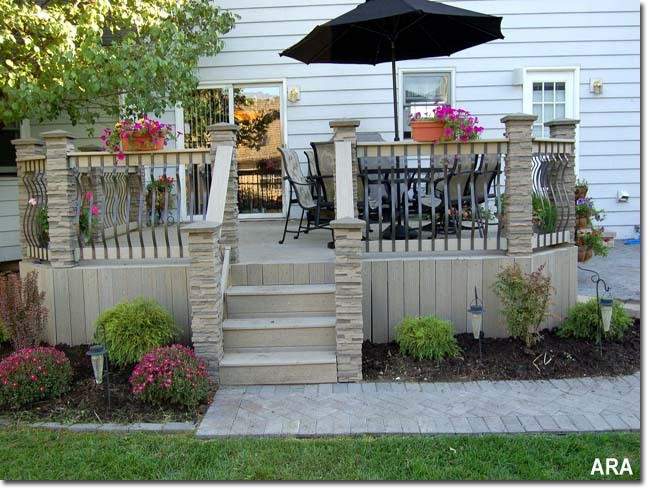 As you branch outside of your house to increase your living space, don’t be shy about decorating your patio or deck. Instead, have fun and be creative!